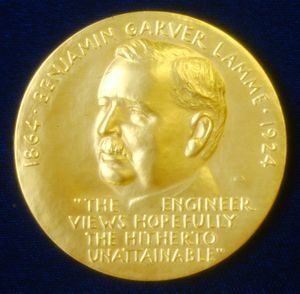 The IEEE Lamme Medal (Lamme Gold Medal) bears the inscription: 'The engineer views hopefully the hitherto unattainable.' These words exemplify the career of Benjamin Garver Lamme, who established the award in his will in 1924. Lamme's bequest was to provide for the award by the Institute of a gold medal annually to a member of the AIEE, "who has shown meritorious achievement in the development of electrical apparatus or machinery. Benjamin Lamme was chief engineer of Westinghouse Electric and Manufacturing Company. He was an outstanding design and development engineer whose many accomplishments included the design of the first large hydroelectric altering current generators in Niagara Falls, USA. Recipient selection is administered by the IEEE Medals Council of the IEEE Awards Board. It may be presented only to an individual. In the evaluation process, the following criteria are considered: leadership in the field, individual contribution versus group contribution, originality of contribution, breadth of work, inventive value and patents, publications, books and papers, achievements in other fields of activity or prominence in other fields, society activities and honors, length of time of dominance in field, quality of nomination. The award consists of a gold medal, bronze replica, certificate, and honorarium. The medal was discontinued in 2008.